April 1, 2015 2:30 am. The above online betting sites are all regulated in either one or multiple Australian states, with most of them boasting the NT Government seal of approval. They all also cater to mobile punters to varying degrees, with most having both Android and iOS apps available. The best online bookmaker might not be the same today, as it is tomorrow. What we mean by this is often one online betting site will have a promotion, or boosted odds surrounding a meeting, while another will have nothing. Your bankroll can really be boosted by shopping around at the different online bookmakers each betting session you have. Remember to gamble responsibly and keep your head and really think about the strategy you are using to pick your horses. Neds.com.au is the new player on the bookmaker scene in Australia and has wasted no time in making a big splash with punters. The brainchild of former Ladbrokes CEO Dean Shannon, Neds boasts comprehensive markets in racing, greyhounds, harness and all of Australia’s most popular sports, both at home and abroad. Neds runs daily bonuses on racing for specific meetings, almost every single day of the week and will be a big player when it comes to the Spring Racing Carnival. Current sign-up offer: Deposit $500 and receive $500 in matched bonus bets. BetEasy is back in the Australian market after the consolidation of WilliamHill and Crownbet. Run by former Sportsbet head Matt Tripp, BetEasy was originally established in 2015 and underwent a change after the company joined forces with Crown Resorts. After The Star Group swooped on the bookmaker, it has come full-circle, back to its original brand, still run by Tripp. BetEasy’s racing section is second to none with every TAB meeting in Australia, New Zealand and many overseas countries. This horse racing bookmaker has a large range of futures markets, including all of the group 1 action from the Melbourne Cup Carnival and The Championships, which are the two biggest racing events on the calendar. If you are a bonus hunter, BetEasy runs daily promotions on horse racing, usually focusing on a specific meeting or part of a meeting. For instance it might mean you might get up to $50 in bonus bets, racing 1-4, if your straight bet finishes second or third. Current sign up offer: Deposit $500 and receive a $500 bonus. Sportsbet.com.au is one of the largest bookmakers in Australia and are known for a great range of promotions. The team at Sportsbet not only provide a wide range of horse racing futures from Australia, New Zealand, Europe and Asia, they are the market leaders for getting their odds released first. This means punters can bet on an upcoming race before anyone else, locking in early value all punters are seeking. Always moving forward in the industry, Sportsbet now live stream all Victorian racing free from your laptop or mobile device. This technology is a first for racing in Australia and Sportsbet look to have backed a winner, with it proving popular over the first weeks of business. Sportsbet provide a comprehensive futures betting market which is second-to-none in the horse racing bookmaker industry. They offer full markets for not only Australia’s biggest races, but they also frame markets for all the major carnivals around the world. These include Royal Ascot, Dubai, Hong Kong and all major Group 1 racing from New Zealand. Their promotional department is constantly updating and there is always a relevant horse racing promotion available. Better prices, protest payouts and head-to-head options are all a part of what Sportsbet offer to every customer. Current sign up offer: 100% bonus up to $501. 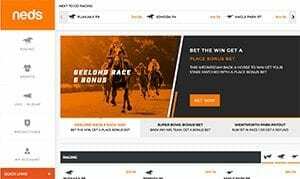 Topbetta is one of the only online bookmakers that is Australian-owned and operated. The company is based in Newcastle in New South Wales. Topbetta is rapidly gaining exposure across the globe for its B2B betting product The Global Tote, which has consistently been beating TAB odds on major racing meetings in Australia. Soon Topbetta hopes to have The Global Tote active at betting companies in the USA, Canada and the United Kingdom, the best part of this being that punters in different countries could soon be creating massive pools on race meetings. While the The Global Tote mid is not available on all Australian race meetings, we have written several articles pointing out how well the product stacks up. You simply MUST have an account at Topbetta to ensure you are always getting the best odds. Sign up here. Unibet is an underrated online bookmaker based out of Fanny Bay in the Northern Territory. Licensed by the NT Gambling Commission, Unibet has a great array of outstanding horse racing offerings. This includes betting markets on every Australian and New Zealand TAB meeting, plus all of the most important race meetings from around the world. In terms of promotions, Unibet Australia definitely attempts to attract the horse racing dollar with weekly Racing Cash Boosts, where every Monday, Tuesday and Wednesday nights punters receive a 25% cash boost (up to $50) on top of their winnings. Unibet also runs some one-off promotions surrounding the bigger meetings, or events, taking place in the Australian thoroughbred industry. Al-in-all Unibet is among the best online bookmakers in Australia. One of the biggest gambling companies in the world, Bet365 is licensed to operate in Australia, and has a huge foothold down under. The company is known in Australia for its big budget advertising campaigns, and of course their outstanding sports and racing product. Available on both Android and iOS, the Bet365 app is also available in Australia, although because of local laws, the online gambling component of both their website and apps is not available. Having said this if you are looking for an online bookmaker with a great reputation to bet on horses in both Australia and overseas this is for you. In-particular the online bookmaker’s strong affiliate in the UK, where it was founded, means they do overseas racing better than most. Another huge positive of this company is they accept punters from many countries where it can be tricky to find racing markets. One of the most well-known betting brands in horse racing in Australia, Ladbrokes has an outstanding reputation among punters. Offering some great promotions on both weekday and weekend racing meetings, Ladbrokes sits comfortably among the top online bookmakers in Australia. The fact the Ladbrokes has enhanced odds as part of its racing produce, plus one of the easiest, most dynamic, websites to use, makes them a no-brainer to have an account at. We have heard mixed reports in 2019 about whether they take on the big punters, but for most the betting limits should be enough. Betfair Australia offers a betting exchange service, which is how it differentiates itself from the saturated sports betting industry. Basically instead of backing a horse to win or place, you can “lay” a horse which means you can take on somebody’s bet on the runner. This is a great way to bet if you think you have spotted out a favourite that is far too short. While Betfair does not have as many bonus and promotional offers, the service they do provide is top notch, with the website being very functional and the customer service first-rate. Don’t fall into the trick of assuming a betting exchange is in the too hard basket, instead learn about it, because there is money to be made. The racing scene in Australia is big business, with it worth 100s of millions of dollars annually. The money bet on horse racing is how it generates its profits and millions of Australians use online bookmakers to punt on the gallops. We often get poised the question: “what online bookmaker has the best odds?”. And like many things the answer to this question is hard to answer and changes from day to day, or even race to race. Because each betting company sets their own markets for each race, there is often discrepancies in the odds. For instance, i’m writing this article on a Wednesday, and there is a meeting at Warwick Farm. In the fourth race, the favourite is paying $3.70 with one online bookmaker, which is the best price, while at five other bookmakers have varying prices, all the way down to $3.40. Then you also have to take into consideration that some online betting sites have services that boost your odds, on selected runners or several times a day. Our best bit of advice when deciding which online bookmaker has the best horse racing odds is to hold multiple accounts and use odds comparison services, as part of your punting practice. By this we mean scour the live updating odds from multiple Australian betting sites prior to the jump of each race and making your bets at the one with the best price. It’s a no-brainer really. Our recommended online bookmakers offer various ways of deposits and withdrawals. To make a deposit at any of our bookmakers, sign up and click on the “make a deposit” button. Credit and debit cards (Mastercard, Visa or other) – The easiest way to deposit money into your betting account. Money is credited into your account immediately and withdrawals can be received usually within the next business day (withdrawals to debit cards might not be supported). Bank transfer – Depositing using bank transfers are usually credited to your account the following work day and withdrawals are received in 2-4 days from processing. E-Wallets (Neteller, PayPal) – Deposits are made instantly with this popular option. Withdrawals can take up to 2-3 working days to process. POLi – Bank deposits can be made via POLi, Australia’s privately owned online payment company. BPAY – BPAY deposits take up to 1-2 days and only Australian customers are eligible to use this method. All our online bookmakers offer multiple platforms to use for betting on horse racing. These include laptop, PC (personal computer), tablets and mobile phones (iPhone and iPad included). All bookmakers have developed apps (applications) which make it easier to bet on the run. Punters have full access to either the main website or the app version, which allows users to gain access to all the information available to those using a computer. There are even great promotions available to mobile and tablet users which include download and first bet bonuses. What Australian bookies stream horse racing? Many Australian bookies stream Victorian horse racing to users mobile phones, under a vision agreement with Racing Victoria. This means for free of charge you can watch any race on your handset. Other: (Upwards of 20 football leagues, cricket, snooker, hockey, 5+ basketball leagues). Stipulations: Must have placed a bet in the last 24 hours, or have funds in your account. Stipulations: Must be logged into your BetEasy account. Stipulations: Must be logged into your Ladbrokes account. Online bookmakers have revolutionised sports betting in Australia and horse racing has been no exception. For many years if you wanted to bet on the horses you would do it in the flesh at a TAB, but now it’s much more common place to wager with an online betting company. Horse racing has become a very diverse industry with a wide range of online bookmakers offering markets and odds for racing all around the world. These betting sites, on top of their Australian horse racing, also have markets on most thoroughbred meetings from around the world. Here at Horsebetting.com.au, we’re all about finding the best value with these bookmakers and ensuring your betting experience is a positive one. Our recommended bookmakers are all giants in the horse racing bookmaking industry as they not only provide the best odds available, but they are trusted and easy to use websites. Depositing and withdrawing funds is a breeze with multiple options available to all AUD customers, for those with big spending limits and the average punter. The best online bookmakers are always moving forward with brand new promotions, deals and website functions that make placing a bet on the horses all the more enjoyable. Remember, before signing up at an online bookmaker, do your research, read betting site reviews and find a bookie that suits you.